100 Donors giving $100 = $10,000 raised! Choose a level to the right or click "Give Now" to give any amount. After a fantastic 2017 season that saw your Cowgirls finish second in league play and capture Player of the Year, Forward of the Year, Defender of the Year and Goalkeeper of the Year honors, this team is excited to see what 2018 holds. The spring was amazing with your team performing at an elite level in the classroom as well as on the field. This current group of Cowgirls earned a 3.6 GPA in the spring semester. And they did it while winning a pair of 7v7 championships! Your donations and support have helped propel us to become a top team in the conference. You've allowed us to travel to places like Wyoming and Colorado and you've given us the opportunity to provide our student-athletes with proper nutrition both at home and on the road. You've allowed us to outfit the Cowgirls in gear that reflects the true quality of our McNeese Spirit. You've even allowed our team the opportunity to take time away from soccer together to just bond, which is important as we work to develop great young people! Without your generous donations our student-athletes cannot have the first class experience that we seek to provide them. Thank you for all that you've done for us! This year, our main goal is to get to 100 donors and build our Cowgirl Soccer Community! Of course we hope to get to $10,000 again, but most importantly we want YOU to be part of our success, whether it's by giving $20 or $1000. This year EVERY donor is given a one year membership to our Striker Club. 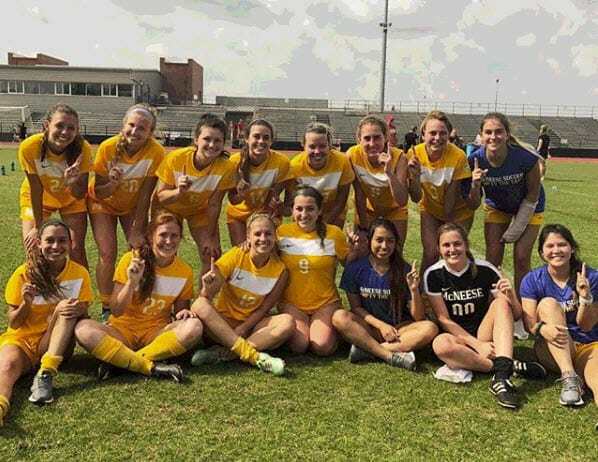 With a Striker Club membership you get an insiders e-newsletter every month detailing what is happening in Cowgirl Soccer. You also get exclusive Striker Club discounts at hotels in Lake Charles and, once construction is complete, you get access to our members only shaded picnic area at the field (coming 2019). The bottom line for us is that we are better with YOU as part of our team. Please help us reach our goals and make you proud! $100! Thank you so much for being one of our generous donors and helping us make it to 100 Hundreds! $250? That's like 2 and a half donors in one donation. YOU ARE AMAZING! $500?! You shouldn't have, but we humbly accept (as we do a ridiculous celebratory dance). You are truly special! $1000 donation?!?! Are you kidding me? You are incredible. We can't thank you enough (but we'll try anyway)!